My people how are we all doing? Long time no blog post. A whole lot has been going on and wasn't really in the mood to work on blog posts. Although, I was really worried about my readers but also didn't wanna put so much pressure on myself. To cut the long story short, I'm sorry for the lack of blog posts and I really appreciate those who checked up on me. Funny enough, my blog views this month was impressive despite the lack of posts. So, this post is just to share with y'all my experience at the just concluded Lagos Fashion Week which took place from the 24-27th of October. I had it in mind to attend this year but wasn't really sure of how many days which also depended on my schedule. This year, I applied for a press pass even though it was almost close to the deadline for application and I wasn't gingered or sure I was gonna get one since I didn't last year. I later received a mail telling me my application was approved and I was happy. The next thing was to pick up my pass on the Island and that wasn't gonna be possible because of work so, I asked my friend Dr Akin to help with my pass and he came through. Finally made up my mind with my friend Wumi to attend Friday and the grand finale on Saturday. Also had two outfits planned out and were both made by ABEBISHOUSEOFSTYLE. The venue this year was changed. 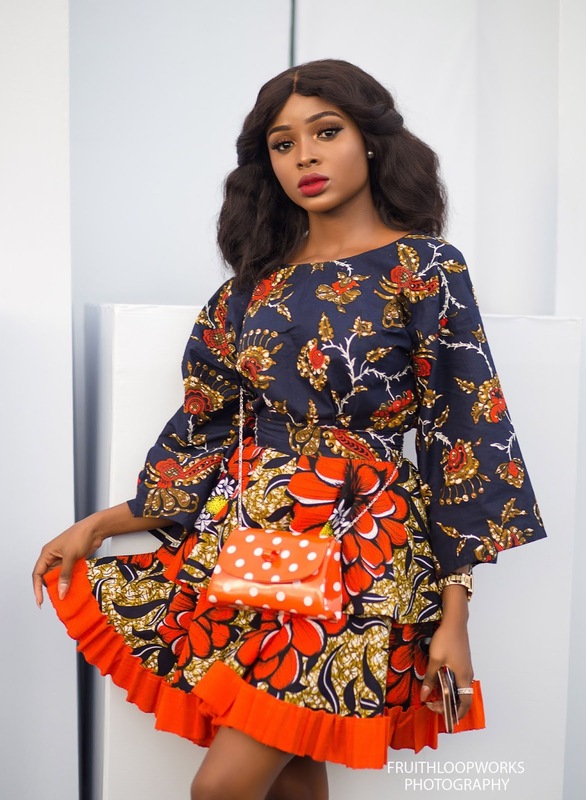 Please check out my post on LFDW last year HERE. FRIDAY: I was attending LFDW with Wumi and Ada so we all had to link up but trust Lagos guys! the traffic was horrible. We were stuck in traffic for over four hours, It was already dark and the runway shows had started. I didn't even bother taking outfit pictures because I was no longer in the mood, was irritated and just wanted to go home for someone who is always picture ready. Loved the color and style of my outfit but no pictures unfortunately. This day was horrible, didn't stay till the end and was already looking forward to Saturday. My fav Designers this day were Dzyn, Ugo Monye put up a great show, Maybelline, Sisiano and Style Temple was amazing!! SATURDAY: Everything was going on well till I left my house and got stuck in traffic again lol. The traffic was crazy but was way better than Friday. My outfit was mixed prints Ankara with Aso-oke. The most interesting part of the outfit is the fact that it was a stoned Buba and Skirt. My tailor came up with this design and I must say she did an amazing job. Paired this outfit with my white Puma sneakers for comfort and my cute mini polka dot purse. It was a print party. Got to the venue around 5:30pm and was able to take loads of pictures. Glad lots of photographers took pictures of my outfit and some other people made videos. Also got lots of the you look like a doll compliment yay! I felt fulfilled and it was time to enjoy the show. Saturday was definitely better than Friday and after the show was the after party. I really had a great time. Shoutout to all the photographers that took amazing pictures of me and every one who walked up to me saying they know me. My fav Designers this day were Tokyo James damn!, Emmy Kasbit, Sisiano, House of Deola & Clan, XII had my heart, wearable pieces, Eki Orleans, Mai Atafo and finally Orange Culture!! what a way to end the show. There were lots of monochrome outfits, suits, tulles, statement hats and accessories this year. 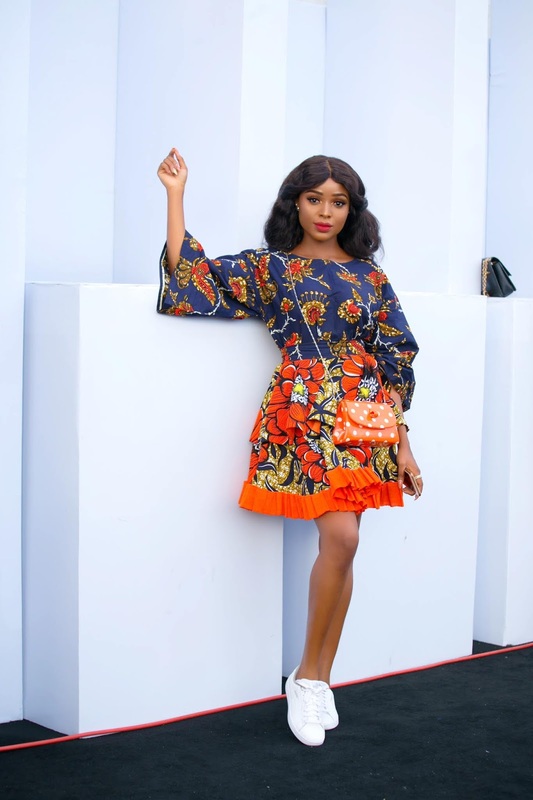 I also made it to the street style looks that won Lagos Fashion Week 2018 on BellaNaijaStyle -Day 4. What do I have to say about the show this year? To be honest guys I preferred that of last year from the venue to every other thing. Although, the area where street style pictures were taken was aesthetically pleasing and really nice for pictures. Also, I felt for the models. Some of them almost fell on the runway just because of uncomfortable shoes. This should be looked into. At some point, it got so hot in the hall during the runway shows on Friday and we started using handkerchiefs or passes to fan ourselves. They also tried because I know organizing such events ain't easy. Looking forward to a better show next year. Thanks for visiting and see you in my next post. Cheers!!! I love the Ankara prints combo so much. Your makeup looks really good too. Lagos traffic is just so terrible in recent times. Nice outfits. I love denim shirts. Your make up is also too good.